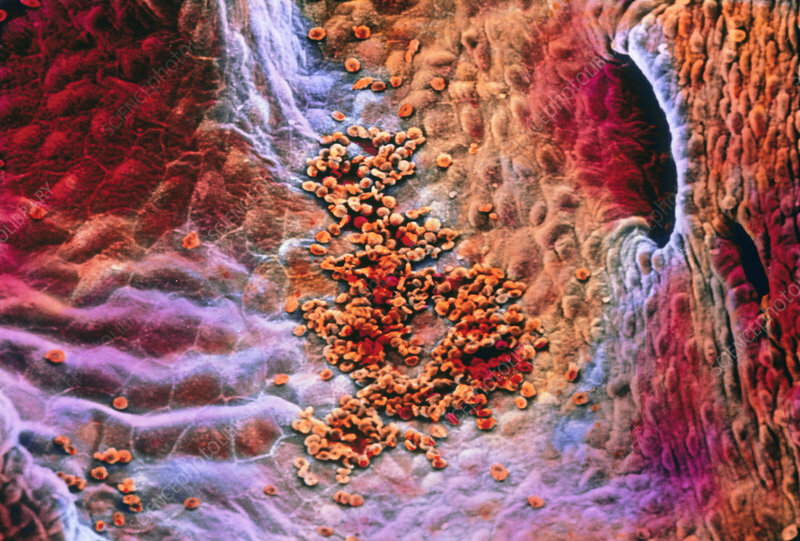 Early stage of blood clot formation: false-colour scanning electron micrograph (SEM) showing an aggregation of red blood cells on the endocardium, the lining of the heart. Clotting is a repair process signalled by the release of thromboplastin from platelets (a type of blood cell) and injured endothelial cells. The formation of a clot, a mesh of blood cells bound by threads of fibrin, is a complex multi-step process. No fibrin is visible at this early stage. Red cells sometimes tend to align into columns (rouleaux formation), due to surface tension effects. Magnification: x210 at 6x7cm size.